We operate with full and proactive measures to detect and report on Fraud and Money Laundering activities. We follow and apply strict processes as recommended by the Bold Legal Group comprising 650 conveyancing firms and the Conveyancing Association. Through these organisations we share intelligence on attempted fraud and money laundering activity. (2) exchange of Contracts (when you become legally obliged to complete the transaction) takes no longer than 4 weeks. "Good communication throughout, helpful guidance and chased proactively to get the purchase completed." Instruct MJP and provide us with certified I.D and certified Proof of Address. For further information about searches and the procedure involved please read this information leaflet. RESPOND TO INITIAL ENQUIRIES – Working with you we will respond to the buyer's solicitors initial enquiries about the legal aspects of your ownership and information you have supplied about the property. REPORT ON TITLE – We will review the seller's evidence of title and other legal and information documents and then report to you. The reporting will continue until we are satisfied with all our enquiries/investigation. The stage when you leave your home! We will confirm receipt of the sale proceeds, pay off any mortgage on the property and send the netproceeds to you; we will instruct the estate agent to release the keys to the buyer. Move in day! We will complete the purchase for you, send across the remainder of the purchase funds, ensure Stamp Duty has been paid correctly, make arrangements for the release of the keys. We send the buyer's solicitors the Title Deeds (if there are any) and other original documentation. We complete all of the necessary post-completion requirements including registering you as the legal owner of the property at the Land Registry. We report to the lenders and you are asked whether you require sight of any surplus deeds. Any balance of funds will also be refunded to you. Our phone lines are open Monday to Friday 9am-5pm. Please note our phone lines will however be closed for lunch between the hours of 1pm and 2pm. *MJP Conveyancing LTD is authorised and regulated by the Solicitors Regulation Authority – SRA No. 590889 http://www.sra.org.uk/solicitors/handbook/code/content.page. 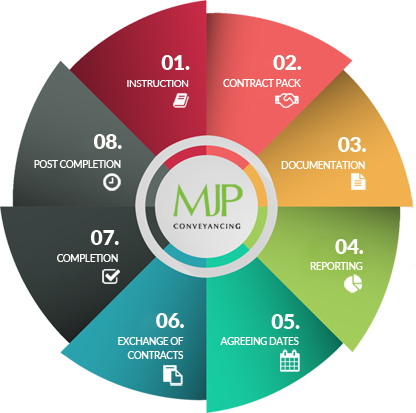 MJP Conveyancing Ltd is a company registered in England and Wales Registered No: 8026741 VAT Number: 157917571. A full list of the directors is available upon request. We use the word 'Partner' to refer to a Director of the Limited Company, or any employee or consultant with equivalent standing and qualification. Equality and Diversity Policy Equality and Diversity Policy Statement for Clients * - In calculating this we measure the average time it takes to reach the stage of exchange ( not the date you actually move in which is known as the completion date) from the date we receive the contract from the sellers solicitors or from when we send the contract to the buyers solicitors. This period can be longer when delays arise which are not within our control. We cannot guarantee that we can achieve this average turnaround time in all transactions. This turnaround time does not apply to leasehold and leasehold and new build transactions.